“Ars longa, vita brevis,” as they used to say. Art is long, life is short. Here’s some new assistance for the arts; no government subsidies required. Painter 11 really captured Joy’s fancy. It’s a professional program with a long learning curve and the results are impressive. Painter is a Corel program for creating digital art. The key and pretty much whole structure is based on brushes. There are many and selecting a particular one determines how a picture will be done. Selecting a pen and ink brush will naturally enough produce a picture that looks as though it had been done with pen and ink. Similarly productive results can be achieved by selecting crayon, pencil, chalk, watercolor, oil paint, etc. Not merely the effect, but the type of brush may be selected as well. It can be thin, broad, soft or hard. Effects can be combined to create new special effects. Combine charcoal with crayon or oil paint and you get an effect not seen in art that uses physical tools, though the look is something like what you would get by painting on highly textured paper. The brushes are touch-sensitive. If you move a brush slowly it lays down more paint or charcoal or ink. Moving swiftly lays down a thinner layer. This kind of control really works best using a digital pen and tablet, instead of a mouse. Wacom (wacom.com) makes one called Bamboo that can be purchased for less than $80. You draw on the tablet with the special pen that comes with it. The drawing will of course appear on the computer screen. A nice and delicate feature of this pen and tablet combination is that the width of your line or brush stroke can be controlled by tilting or twisting the pen. 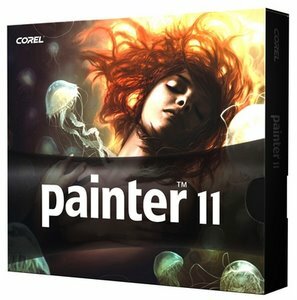 Painter 11 is fairly expensive: $429 list price for Windows or Mac, or slightly less from discounters like Amazon.com. There is an educational edition available for just $100, but you must provide proof that you are a student or teacher at a recognized school. Usually this means just showing an identification card. You can find many deals of this kind at Studica.com and AcademicSuperstore.com. If you can’t qualify for the special educational pricing, there is a $100 version called “Painter Essentials,” which gives you most of the tools. If you really like what you’ve created, you can have it reproduced on canvas at CorelPainterPlus.com. Prices start at $59; you can see examples there.